Fluorescence image of a cloud of ~5 billion atoms in a sodium magneto-optical trap at NIST. NOTE: This page is about my former research. I am currently setting up a new lab to study ultracold atomic gases at The University of Oklahoma. Please visit my faculty profile page for more current information. At NIST, using laser-cooling and trapping and forced evaporation, we cooled a cloud of cold sodium atoms down to temperatures below a microkelvin, where it undergoes a phase transition from a thermal gas into a Bose-Einstein condensate (BEC). In our BEC, atoms with three different spin states, m = -1, 0, +1, were simultaneously trapped with a tight, approximately spherically symmetric, optical trapping potential. In this configuration, spin-changing collisions between atoms generate a nonlinear interaction that causes the system to oscillate between different spin states. This nonlinear interaction creates exotic non-classical spin states, so-called spin-squeezed states. Spin-squeezed states can be used for atom interferometry beyond the standard quantum limit, e.g. with higher sensitivity than allowed by classical states . Compared to light interferometry, atoms have the benefit that they are much slower than light, and thus allow for long interrogation times on the order of tens of seconds. Recently, at NIST, we measured coherent spin dynamics in a thermal cloud above the transition temperature to BEC . The nonlinear spin dynamics we discovered in the thermal gas were surprisingly similar to the BEC case, apart from a factor of two in the interaction energy due to the distinguishability of thermal atoms. This suggests that spin-squeezing might be possible in a cold thermal cloud, and a BEC might not even be neccessary to perform atom interferometry below the standard quantum limit. 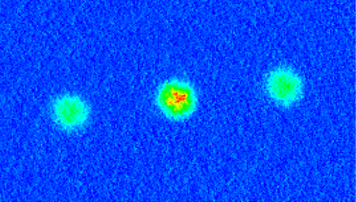 Time-of-flight absorption image of ~90,000 Bose-condensed sodium atoms released from our crossed optical dipole trap. An applied magnetic field gradient separates the three spin states prior to imaging. Over time, coherent spin-changing collisions cause atoms to oscillate between m = 0 pairs (center) and pairs consisting of one atom in the m = +1 state (left), and one atom in the m = -1 state (right). In addition to my former research at NIST involving a spinor BEC and exotic spin states, I investigated highly excited states of cesium and rubidium atoms in Jim Shaffer's research group as part of my dissertation research. These so-called Rydberg atoms are exotic because the electron is extremely far away from the nucleus. This leads to many exaggerated properties. For example, using laser-cooling and trapping and photo-association, we created cold ultralong-range molecules of weakly-bound pairs of cesium Rydberg atoms with internuclear distances of several micrometers, and we showed that these exotic molecules are exquisitely sensitive to external electric fields [3,4]. Later, we performed quantum optics experiments using Rydberg atom electromagnetically induced transparency (EIT). 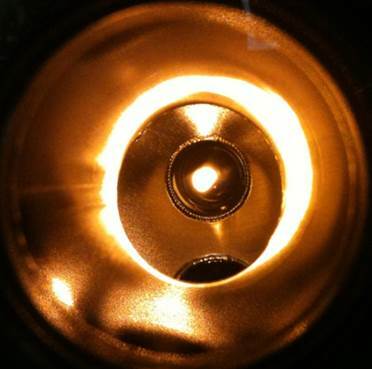 In EIT, a medium that is normally opaque becomes transparent when illuminated with a strong pump laser beam. The effect is due to a quantum interference between two different excitation pathways that the atoms can undergo in presence of the applied light fields. Specifically, we employed a 4-level ladder-type Rydberg EIT scheme with rubidium atoms, where two different Rydberg states are resonantly coupled by a microwave field, and one of the Rydberg states is also coupled to the atomic ground state through the first excited state by two light fields. With this setup, we were able to combine the high sensitivity of Rydberg atoms to external electric fields with the quantum interference effect of EIT in a quantum-assisted sensing approach to create a microwave sensor with high sensitivity [5,6]. I am also always highly interested in the application of modern technologies such as field-programmable gate array (FPGA) technologies to atomic physics experiments. For example, a while ago, I designed and programmed a low-cost FPGA-based laser locking circuit using off-the-shelf parts and a Nexys-2 prototyping board . The VHDL source code is here. A. M. Marino, N. V. Corzo Trejo, and P. D. Lett, "Effect of losses on the performance of an SU(1,1) interferometer," Physical Review A 86, 023844 (2012). H. K. Pechkis, J. P. Wrubel, A. Schwettmann, P. F. Griffin, R. Barnett, E. Tiesinga, and P. D. Lett, "Spinor dynamics in an antiferromagnetic spin-1 thermal Bose gas," Phys. Rev. Lett. 111, 025301 (2013). A. Schwettmann, J. Crawford, K. R. Overstreet, and J. P. Shaffer, "Cold Cs Rydberg-gas interactions," Phys. Rev. A 74, 020701(R) (2006). K. R. Overstreet, A. Schwettmann, J. Tallant, D. Booth and J. P. Shaffer, "Observation of electric-field-induced Cs Rydberg atom macrodimers," Nature Physics 5, 581 - 585 (2009). J. A. Sedlacek, A. Schwettmann, H. Kübler, R. Löw, T. Pfau, and J. P. Shaffer, "Microwave electrometry with Rydberg atoms in a vapour cell using bright atomic resonances," Nature Physics 8, 819-824 (2012). J. Sedlacek, A. Schwettmann, H. Kübler, and J. P. Shaffer, "Atom based vector microwave electrometry using rubidium Rydberg atoms in a vapor cell," Phys. Rev. Lett. 111, 063001 (2013). A. Schwettmann, J. Sedlacek, and J. P. Shaffer, "Field-programmable gate array based locking circuit for external cavity diode laser frequency stabilization," Rev. Sci. Instrum. 82, 103103 (2011).